Heyyyyyy, everyone. I hope you all had a less eventful week than I did! My gallbladder suddenly became infected (and even became gangrenous), so I had to be hospitalized and have surgery for the first time. Between the pain, the pain meds, the drowsiness, etc., I'm not entirely "with it" and don't feel like doing much, so I'm just going to attempt a quick lip balm review for today. 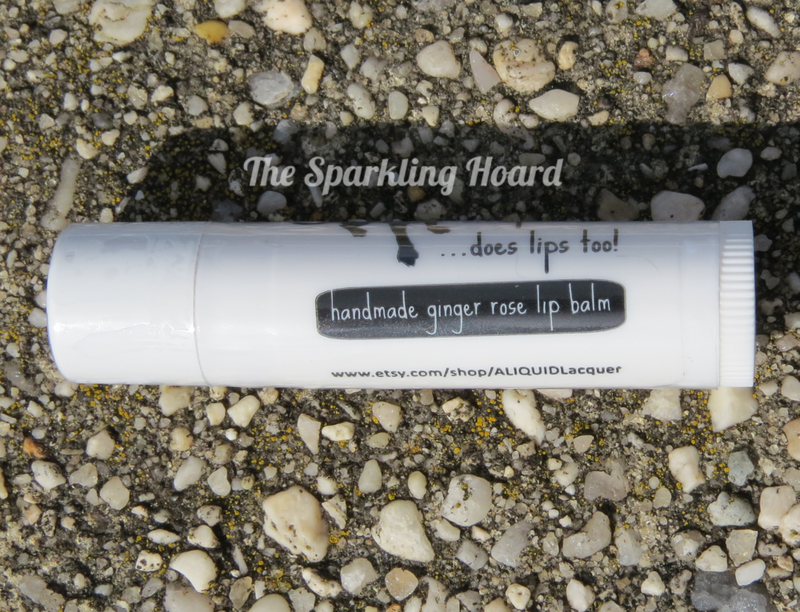 ALIQUID Lacquer Ginger Rose Lip Balm is a new scent in ALIQUID's lip balm lineup. This is a very unusual scent, a bit like potpourri with an exotic flair. I don't think it's for everyone, but if you're into, say, drinking floral teas or eating the rose hips out of your rabbit's dried flower treats (like me...don't judge! :-p), you'll probably enjoy this scent. It's not flavored, but you may feel almost like you can taste it. The balm is very firm, but melts easily onto the lips, providing great moisture! Materials: mango butter, beeswax, apricot kernel oil, olive oil, fragrance. Ingredients produced in a facility that processes nut products. Each tube contains about 4 grams of product. You can buy one tube of balm for $2 or three tubes for $5 at the brand's Etsy shop. It is also available in Mint Citrus, Lavender Honey, Chai, and Vanilla scents! Be sure to keep up with the latest ALIQUID Lacquer releases by Liking the brand on Facebook and signing up for the brand's newsletter. Hope you feel better! Nice review on this lip balm. This scent is probably one I won't pick up but the other ones sound good. I'm always looking for a new lip balm to try out too. Ooh, mint citrus sounds amazing.